Got a student society event coming up and need flyers fast? Running a nightclub and looking to save money? Call MuPrint NOW! We print the handouts the clubs use and we can print them quickly – typically on the same day for short runs (e.g. up to 1000 A5/2000 A6). So we offer superfast turnaround and we offer them at great prices too. We’ve revamped our prices to make it even better value for larger quantities. 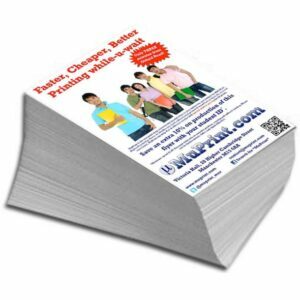 Now you can get same day leaflet printing at a great price for, say, when your litho printer has let you down. Have a look at the link below to see the new prices, and also some special web-only offers! MuPrint – great prices, great service, great location. The convenience of ordering online and then picking up from our shop in Manchester is perfectly possible. Or BYPASS the overnight delivery – come and collect! It’s cheaper and faster. We’re right in the middle of Manchester – near the new Crowne Plaza hotel – use the Post Code M15 6AA on your Satnav to find us. The price for multiple copies applies only if all copies are from the same design. If you have different designs, please add each one to the basket separately. Need flyers fast? MuPrint can help! If you can wait a few days then you can make massive savings on the same day price. Or if you need several thousand flyers, then we can Litho print them to give you the best value. The MuPrint shop is at Liberty Central near the Manchester Aquatics Centre and RNCM – about five minutes walk from Oxford Road where your leafleting team hang out – so just ask them to pick up from us directly to save you the bother! If you really want it couriered, we can do that too for a little extra – it’s nay bother to us! Before you print a million of the darn things, choose MuPrint to get 500 printed while-u-wait. Panic Over. You have your finished job in your hand. Then, when you hand them out to your team and your customer, but then your partner spots a glaring typo which everyone missed, you still have a chance to stop the presses before the big push! For printing to the edge of the paper, your flyer design must have a bleed. What is a ‘Bleed’? If you need more than 2000 leaflets/flyers and you can wait a week or two, then standard offset litho printing could be the answer. MuPrint offers competitive prices on long-run printing and all prices INCLUDE checking your file and giving you a free digital proof. Please ask us for a quote! Flyers are normally zero rated for VAT so the price you see is the price you pay. However, some things can make a flyer liable for VAT at 20% e.g. a voucher, a form, a map, a ticket, an invitation. If your flyer includes one of these then we must add VAT to the price. Even something like “10% off with this flyer” for example would effectively make it a voucher. Please be aware of this and until the final check is made on your artwork before printing, any quote we give you will be subject to standard rate VAT on those items that we are obliged to apply VAT by law.